All in all, it’s been a pretty tame cycle. But some political mail pieces stand out for their badness. I maybe should have been better about getting my collection out of the house in previous years. I’m not sure what I like about mailers. It’s an art. They are windows into what political consultants have polled and tested — what messages they think work. It’s the most basic way to communicate with voters. Put something on paper and send it to their houses. It is remarkable to me that in the age of Facebook, Twitter, texting and Google, direct mail seems to only thrive. I’ve been collecting all my and my readers’ mailers on this Twitter thread and filtered out the five worst I’ve come across. All in all, it’s been a pretty tame cycle. But some stand out for their badness. 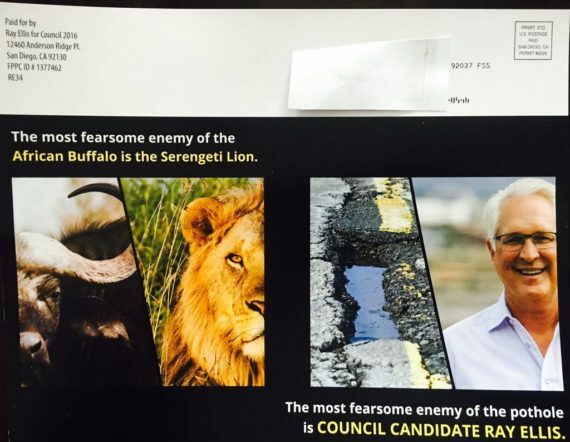 In 2014, Lorie Zapf introduced a particular style of mailer comparing the candidate in question to a brave or savvy animal. It appears Councilman Scott Sherman, who is running for re-election really liked it, because he did his own this year. But there was immediate controversy. Was the picture of a mongoose or a meerkat? Are they the same thing? What is going on? Apparently, it all originates from this viral Smithsonian Channel video. It has more than 12 million views. It’s definitely riveting. Now, what’s interesting about that video is that the mongoose (or meerkat?) does challenge the cobra bravely. But it gets bitten and runs away. 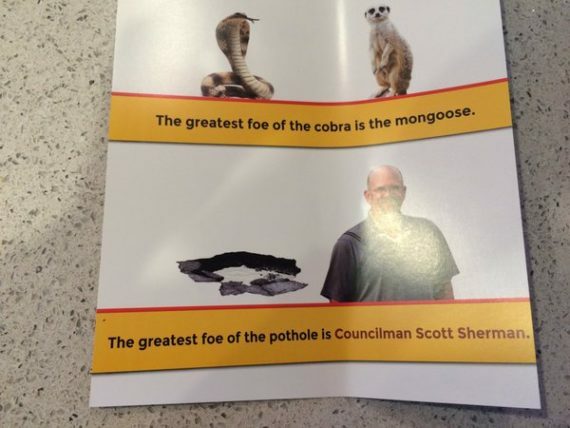 I’m not sure that’s the message Sherman wants to send about his approach to potholes. Now, Ray Ellis has dropped his own version. But he made a curious choice. 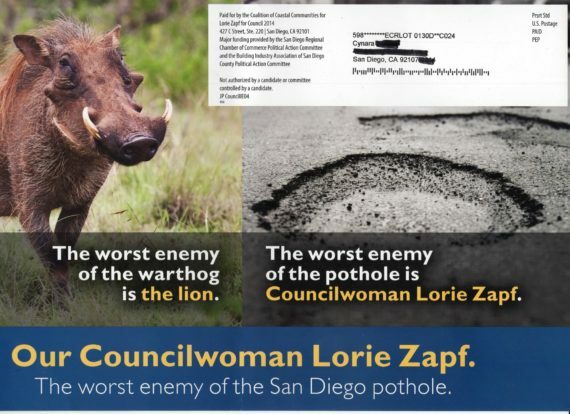 The mailers for both Zapf and Sherman used threatening or ugly animals as the ones that need to be destroyed, like potholes. Warthogs and cobras are ugly (or bad?) and brave animals should kill them. Like potholes. Kill them like potholes that bite and chase poor councilmen away. Ellis followed Zapf’s lead and compared himself to a lion. But the enemy his lion faces down is … the African buffalo? Who has anything against African buffaloes? Why do we want to kill African buffaloes? They’re just chilling, buffaloing around. Many of us expected the San Diego city attorney’s race to be the meanest contest of the year. But it has been pretty tame. 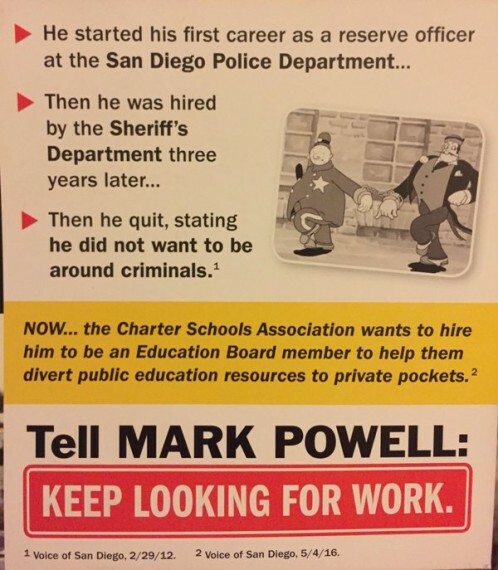 The meanest onslaught I have seen so far has come from the American Federation of Teachers, or AFT, which is trying to smash Mark Powell’s bid for a seat on the little-known County Board of Education. Several versions of the same type of mailer have hit Powell. I’m not exactly sure how the first two bullet points are supposed to hurt him. You were a cop … loser! That’s attributed to, wait for it, Voice of San Diego! Also, the contention that charters divert public education resources to private pockets is a dumb old canard. It seems to rest on the fact that charter schools often hire contractors to help run them. The AFT isn’t letting up. It has even re-hashed an argument we reviewed in 2012 that Powell was fired from his job as an assistant principal. He was not fired. He was demoted from administration to teaching, along with many others, under the management of controversial former San Diego Unified superintendent Alan Bersin — not a guy whose decisions teachers unions usually supported. 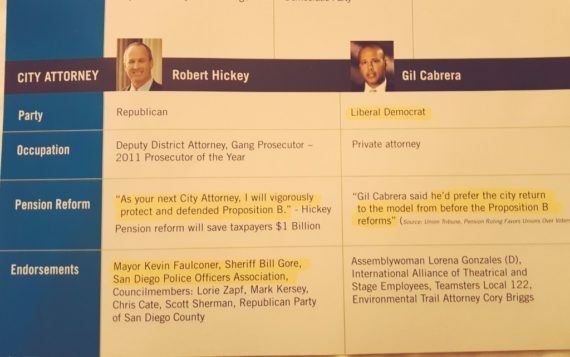 This GOP mailer sought to highlight the differences between Gil Cabrera, one of the four Democrats running for city attorney, and Robert Hickey, the lone Republican in the race. It’s bad for a few reasons. The first is that it has two ridiculous spelling errors. I’ve had my share of them but I get dinged appropriately for them. I do think some local hiking trails could use an attorney. Not sure Briggs is their man. Cabrera has said he voted against Proposition B and that he had liked the previous version of pension reform where new employees had greatly reduced pensions from previous generations. But the U-T story cited on the mailer doesn’t include his name or the quote cited. The union mentioned, the Theatrical and Stage Employees, is not a Teamsters local. This might be the sloppiest mailer I’ve seen. Hickey, for his part, has been an advocate for pensions at the county, where he earned one as a prosecutor and leader of the prosecutors labor union. He does, however, support pension reform and has said he will not take one from the city. 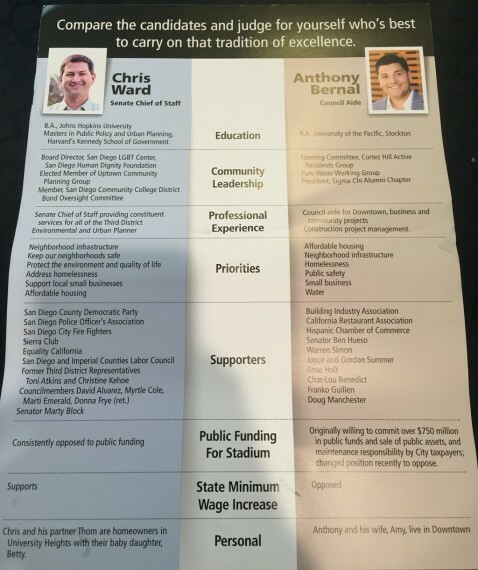 There’s just something odd about this mailer circulated by the Democratic Party in support of Christopher Ward for City Council in District 3. Note the “personal” comparison. What is going on there? Is “downtown” — which is part of District 3 — a pejorative? Not having kids? How do you compare and “judge for yourself” people’s families? Also, the education comparison seems elitist. I actually think many of the mailers panning City Council candidate Barbara Bry for supporting the Citizens’ Plan, the blueprint put forward by attorney Cory Briggs and former Councilwoman Donna Frye, are fair. Most of the Lincoln Club’s work toes the line with something a message along the lines of: “She supports a plan that the Chargers also support.” It’s a sign of how badly the Chargers are seen in that district but it’s not wrong. I’m not quite sure why Ellis didn’t just let the Lincoln Club do all of this work. Ellis’ mailer here is not good. First, I hate the forced imagery. 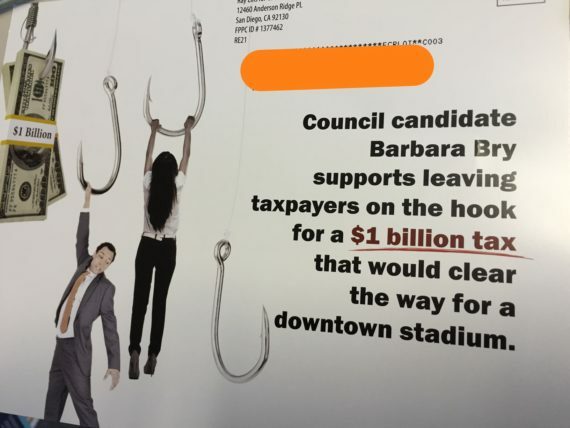 The mailers where designers try to illustrate terms like “on the hook” with these bad Photoshop mashups are the worst. Also, if you’re going to illustrate people “on the hook” with actual fishing hooks, you can’t get away with them holding onto hooks. They could, after all, just let go of those hooks. You have to impale the people with the hooks. If you’re not willing to do that, you can’t illustrate “on the hook”with images of people and hooks. This is a fact. Impale or find something else. The Citizens’ Plan does increase taxes on visitors staying in hotel rooms. But the tax itself isn’t what “clears the way” for a downtown stadium. We’ve had some pretty deep discussions on whether that tax could be considered a subsidy for a stadium if one is built on top of, or on the side of, the new convention center it does fund. The latest one was here. The bottom line is: Without the tax hike, the building — this convadium —won’t get built whether it has a stadium or not. This is not a good argument. There’s no less money in the city’s general fund to pay for streets and programs if the tax passes. It is the opposite. It is a significant increase to the hotel-room tax and will send a portion of what’s raised straight to the city’s general fund. If it does not pass, that won’t happen. You aren’t protecting any dollars that can go to after-school programs from the convadium if you oppose the Citizens’ Plan. You’re actually keeping a lid on revenue that can be used for those programs. That’s a fine policy! Just own it. Again though, I would probably have been fine with the mailer had they just illustrated voters being actually impaled by the hooks. Little graphic, sure, but consistent with the dang cliche.